Actual colors may vary slightly from those items shown here. Orders will be delivered by the Swim Team during the first week of practice. 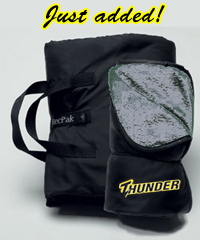 Waterproof black polyester backing with 100% poly gray blanket. Folds up easily with a carry tote and external patch pocket. Your choice of pink or gold Thunder graphic on backing. 50" x 60"
The classic hooded sweatshirt. 50/50 cotton/poly blend with double-lined hood and matching drawstring. Rib cuffs and hem, pouch pocket. Sizing chart at checkout. Your choice of pink or gold Thunder wave graphic. super-soft 60/40 ringspun cotton/ polyester blend for comfort. Spandex cuffs and waistband, pouch pocket. Add name below logo for extra $5 Heavyweight 100% poly brushed tricot with full zipper, front pockets, elastic cuffs, elastic drawcord and cordlock. Machine-washable, too. Embroidered graphic. Sizing chart at checkout. 100% poly knit wicks away moisture to keep you cool and comfortable. Stylish piping is pretty cool, too. Rib-knit modified Vee-neck collar. comfy, too. 96/4 cotton/spandex. Choice of pink or gold graphic. Scoop-neck tee creates a flattering fit with its 1x1, 4.5-oz 100% ribbed fine jersey construction. Choice of pink or gold graphic. Sizing chart at checkout. Great as pajama bottoms -- pair them up with your favorite tee! -- as loungewear, or as a fun, casual look. No fly, no pockets. Available in gold and black, or pink and black. Sizing chart at checkout. 98/2 cotton/Spandex twill blend in a stretchable cap. Pre-curved bill. With a big clip for convenience.